Save on LTO5 tape drives! Call us or fill out our quote request form! 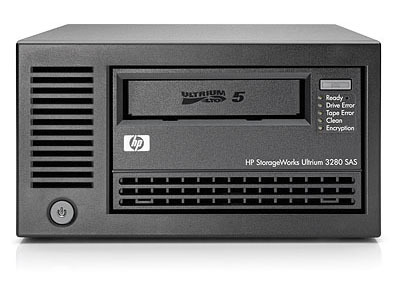 An LTO 5 tape drive (LTO-5) offer a storage capacity of 3 TB (assuming 2:1 compressed) – and transfer rates of up to 280 MB per second (assuming 2:1 compressed). LTO Ultrium format generation 5 includes LTFS (Linear Tape File System) partitioning functionality enabling capabilities that can help enhance file control and space management, addressing the growing needs of marketplace segments such as Rich Media. At approximately 6 cents per Gbyte for LTO-5 tape media, an LTO 5 tape drive offers one of the lowest costs per Gbyte for long-term storage – particularly when factoring in physical space and energy costs. Tape is cool – literally! Tape storage has been shown to decrease storage power requirements by 99% when compared to disk-based storage. An LTO 5 tape drive include hardware based data encryption to prevent unauthorized access to data at rest. They use the Advanced Encryption Standard (AES) with the longest and most secure keys, 256 bits, designed to be compliant with the emerging standard for tape drive security, IEEE 1619.1. Tape helps organizations to keep pace with data growth, simply add in more tapes to scale, and store them in a safe or vault at regular ambient conditions. Don’t see the LTO5 tape drive you need? We offer every model LTO 5 tape drive by all of the major LTO5 tape drive manufacturers, please fill out our Quote Form to get a free quote on the LTO-5 Tape Drive you need.